The exercise will be hosted by Hungary at Pápa Airbase and takes place from the 1st to the 12th of May. 17 air assets and 450 personnel are expected to take part in this live fire focused training exercise. FIRE BLADE 2017 (FB17) marks the 11th helicopter exercise under the umbrella of the Helicopter Exercise Programme (HEP). The HEP is one of the European Defence Agency’s (EDA) helicopter training projects and programmes. It is the first time that Hungary will host a HEP event, thus becoming the 7th member state to do so. In excess of 450 personnel are due to take part in this exercise programme. A total of 17 air assets from 5 Member States (Austria, Belgium, Germany, Hungary, Slovenia) are expected to take part. In addition, observers from Italy and Czech Republic are foreseen. FB17 will deliver tactical training, over a 12 day intensive programme, offering participants an unique opportunity to plan and execute missions within a joint combined framework. FB17 will be designed to allow European helicopter crews to train, adopting joint procedures while operating in a challenging scenario. During the Final Coordination Conference for FB17 in Bruxelles the Head of Education, Training & Exercise Unit at EDA Tom Bennington commented, “the exercise gives a good opportunity to train in a realistic operational setting. Specifically we will be working with Special Forces, and will be focusing on live weapons firing using the Composite Air Operations Concept, effectively operating the helicopters with fast jets and ground assets [e.g. surface-to-air missile (SAM) systems]”. At the event, on behalf of the host nation Hungary, Lieutenant colonel Péter Simon of the Hungarian Air Force and Commander of the Air Task Force for exercise FB17 said, “as per previous Blade exercises, FB17 will have its own training subjects, in this case live firing. Hungary is an excellent location for live fire exercises due to diversity and quality of ranges available to visiting European crews”. 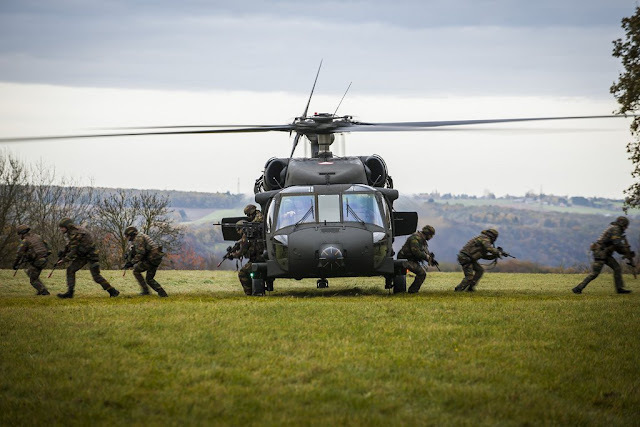 The aim of the exercise is to enhance interoperability at a tactical level between helicopter units by using the COMAO concept in a combined, joint, realistic and challenging environment and to teach and learn helicopter Techniques, Tactics and Procedures (TTPs). During FB17 the units will fly a diverse set of day and night training missions, with a focus on live firing operations. FB17 is a real-world example of what can be achieved through European defence cooperation. The Hungarian Air Force Gripens also will take part in the exercise flying CAS missions (Ed. ).